“ST.-VICTOR-DE-CESSIEU, France — The French, known for their mistrust of banks, are not just stuffing money into mattresses in these anxious days of recession and minuscule interest rates. They are also putting their cash into cows. These are not exactly cash cows. But investment in Mr. Marguerit’s Holsteins will bring a 4 to 5 percent return a year after taxes, he said, based on “natural growth” — the sale of their offspring. That compares to an interest rate now of 0.75 percent on the basic French bank account. Last year, his business went up by 40 percent, and so far this year, it has “practically doubled ,” said Mr. Marguerit, the managing director of Élevage et Patrimoine, a cattle investment firm in this part of eastern France, near the Alps, and president of Gestel, which works with farmers and investors. 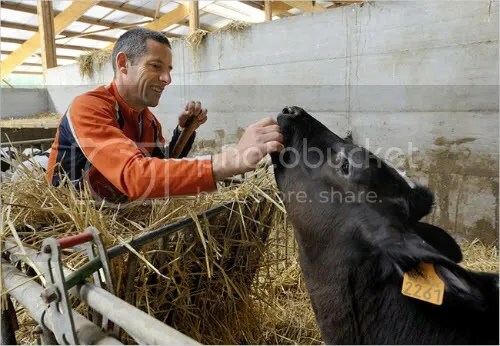 At the moment, there are about 37,000 cows under contract in France at some 880 farms, according to the French Association for Investment in Cattle. But the potential market is huge, Mr. Marguerit insists, perhaps as many as one million head in France and six million in Europe as a whole. “At this difficult time, it’s a much better investment than real estate and much more tangible than the stock market,” Mr. Marguerit said. He then proceeded to praise the new interest “in natural, organic and lasting things” among the French, who have always romanticized the countryside and imagined themselves shrewd peasants at heart. “This is part of the patrimony,” he said. In the steep financial crash, “we’re having a moment of realization — we’re landing hard and people are asking real questions.” Diversify into cows? Why not? For Richard Durand, the arrangement frees up capital for improvements to his small dairy farm here, 500 acres deep in the countryside about 35 miles southeast of Lyon. He provides his 100 Holsteins with the best of everything, including a view of the mountains and the grassy fields where they spend the summer months. Even better, they can have a massage — a large round brush they rub against whenever the urge hits them. He calls his property “The Farm of the Happy Cows,” and so they seem, so far as one can tell. Mr. Durand “rents” 37 of his 100 cows, all of whom he knows by name and not just by the numbered tags punched through both ears, like big plastic earrings. He seems especially fond of Tartine, a brown and white Holstein who likes her head rubbed. Mr. Durand, 48, has come up in the world. “I smelled of cows until I was 42,” he said, describing how he had to clean their hooves with his fingers and showing off the automated sledge that runs on a track down the middle of his modern barn, sweeping away the excrement and soiled straw of all those happy cows. Now he confines himself to making cheese, while others deal with the straw and the twice-a-day milking. He sells his excellent fromage blanc, butter and yogurts to local markets that feature artisanal products, while most of his 200,000 gallons of milk a year are sold to the local cooperative. Read the whole story on the New York Times website.